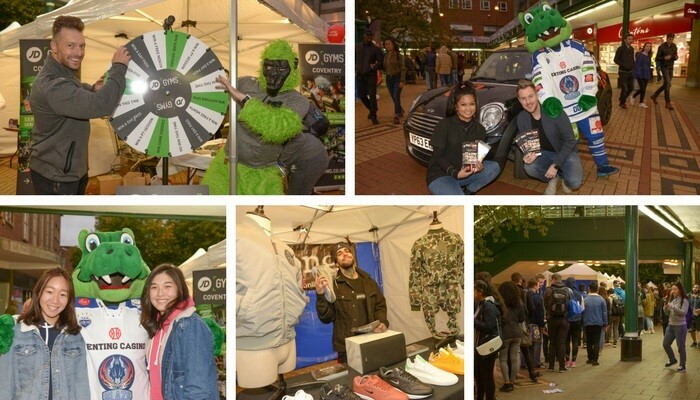 Coventry’s student shopping spectacular proved to be a massive success with thousands turning out for the annual event. Around 5,000 students attended the evening and treated themselves to some of the many bargains that were on offer. New and returning students were welcomed in style as businesses stayed open late and offered discounts and freebies. A whole host of entertainment was also on offer including DJs, games, fairground rides and much more throughout the event. To see for yourself watch this video produced from the evenings events. The successful night was organised by Coventry Business Improvement District in partnership with Lower Precinct Shopping Centre and West Orchards Shopping Centre. Coventry BID manager, Trish Willetts, said: “I would like to say a huge thank you to everyone that took part and helped to make it a memorable evening for everyone. “It was absolutely fantastic and we are so pleased the night was a hit, here’s to the next event.